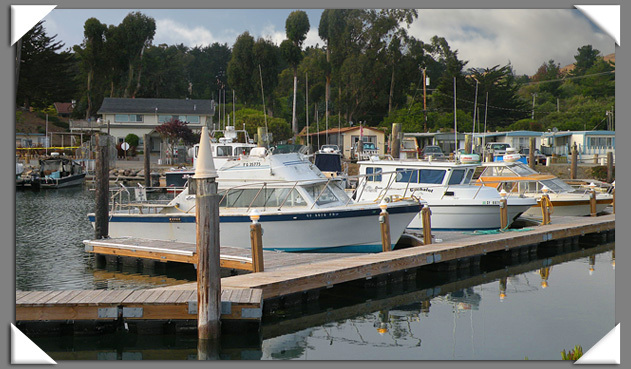 Porto Bodega Marina and RV Park has 57 boat slips with 20 Amp services and water. Licensed agreement berth holder slip rates and fees are $4.00 per foot, per month. Also, a $5.00 electric hook-up fee is charged each month. Based on availability and accommodations in our RV Park, nightly berth rental is possible at $15.00 per night. Our launch facilities are only available to licensed berth holders and Porto Bodega RV campers. Restriction may apply. See Rates schedule. Rates include use of designated slip or dock, use of bathrooms and showers, and boat launch facilities. Boat launch facilities are only available during business hours and restrictions may apply. Photograph by Connie Bennett. Copyright 2006-2010, all rights reserved.